Congratulations on your engagement! Thank you for considering Sonnenberg for your wedding ceremony, wedding reception, or wedding photo shoot. Our Garden Season runs from mid-May through mid-October, providing a beautiful outdoor venue while our flowers are in bloom. 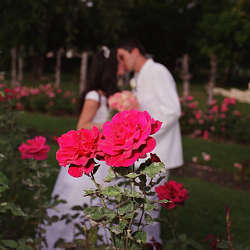 Our unique gardens offer many varieties of annuals and picturesque landscaping, and our staff is ready to help you create treasured memories of your wedding day. We invite you to explore the many services Sonnenberg offers.